Guys. Can I just say it’s 97 degrees in Orange County right now and it was 110 yesterday! 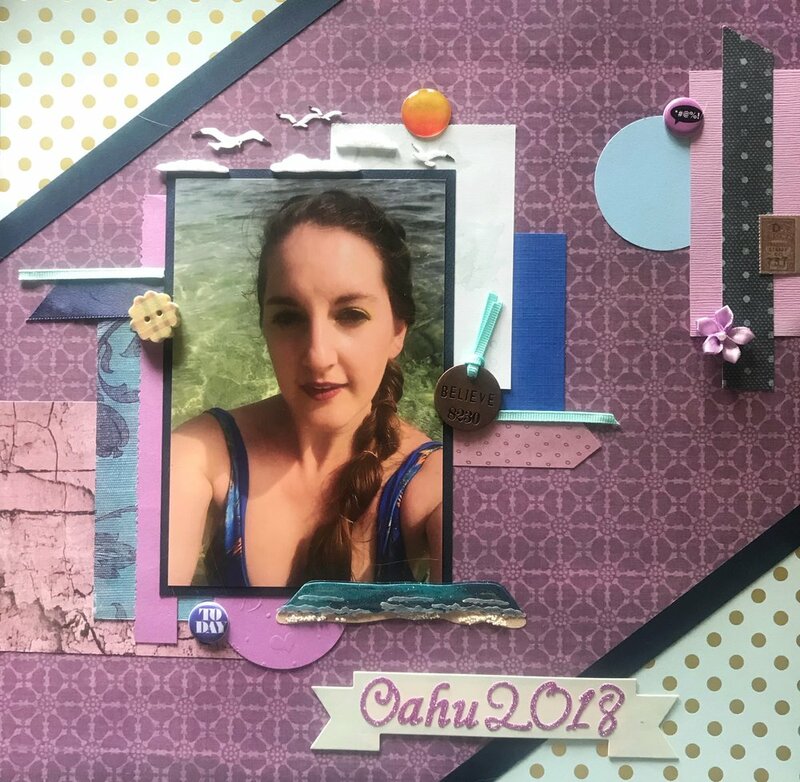 To distract myself from it being possibly the hottest summer on record, I’m posting another page I put together for a scrapbook challenge. Summer is here with a vengeance and the page I bring you definitely fits he mood. This photo was taken during our latest trip to Hawaii last April. The waters of Waikiki are crystal clear and made the perfect backdrop for a selfie. I started with purple patterned paper (sat that 3 times fast) from my new Violet Leaf Stack by DCWV. Side note: have any of you fellow scrappers heard of a store called Tuesday Morning? I just discovered one in my neighborhood and their scrapbooking section is unreal! I found embellishments, adhesives, paper stacks etc. all for seriously reduced prices. The Violet Leaf stack was $7! Most paper stacks a Michael's or Hobby Lobby are double that! I totally recommend checking out your local Tuesday Morning for fabulous scrapper finds! I love going through my paper scrap drawer and finding pieces cut into odd shapes or have an edge that is torn or cut with fancy scissors. Sometimes I can use those as design elements that add unexpected interest. 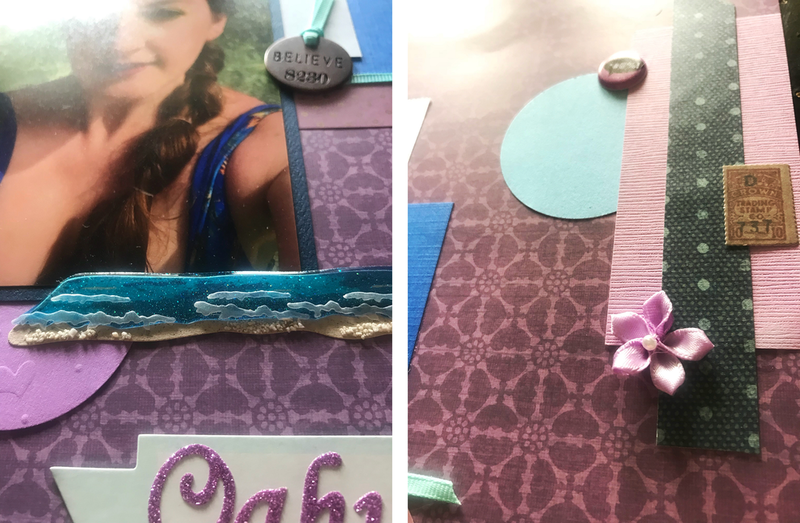 This page was done for Lasting Memories July challenge whose theme was “selfies.” I just printed a new stack of photos to scrap and it was one of the only selfies in there! This Design Seeds template was the inspiration for this page’s color scheme. The blues obviously complement the water colors in the photo and the purples match my lipstick. Making the background purple provided greater contrast for all the blues in the photo, really making it pop! The layout for this page comes from ­­­­Let’s Get Sketchy’s July challenge. I altered it t fit my vertical photo instead of a horizontal one. I like the triangles in the corners of the page and feel they help frame my photo.